Makoto Matsui as an oiran (courtesan) of the Edo period and as Prince Genji of the Heian period. In conjunction with the Nisei Week Japanese Festival, noted actor/singer/dancer Makoto Matsui will put on a show with his U.S. friends at the Aratani Theatre, 244 S. San Pedro St. in Little Tokyo, on Sunday, Aug. 9, at 1 p.m. 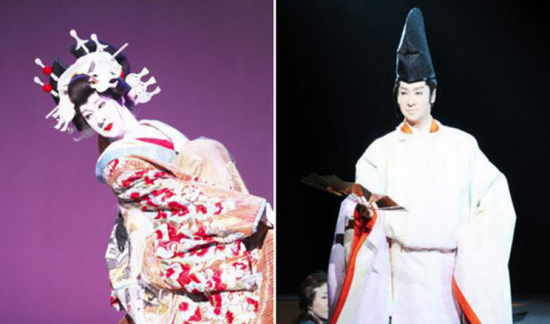 The two-hour stage show will highlight Matsui’s female-role dancing, recreations of famous Japanese stories, and authentic Japanese classical dance accompanied by shamisen and biwa music by Mme. Yuusui Fujinaga and Mme. Yuuka Fujinaga from Kitakyushu City. Joining the show from Tokyo are two performers from Matsui’s troupe, Koyuki Akane and Takuma Kaneko, a.k.a. Yumenojo Shitamachi. The show also will feature local artists such as Matsutoyo Kai (folk song ensemble), Wakayagi-ryu Wakahisa Kai, Bando Hidesomi Nihon Buyo Kai, Bando-ryu Hana no kai, and Tamagusuku-ryu Kansen-Kai Yonamine Keiko Ryubu Dojo, along with singers from Los Angeles and Las Vegas. Tickets are $60, $45, $40 and $30, and will be available at the box office.